The Flowering Tea Gift Set from Numi and Organic Style showcases a decorative flower that blooms in hot water as the tea steeps, creating multifaceted, yet soothing flavor notes. Just Add Honey’s Tropical Green Tea blends pineapple and papaya to produce a relaxing experience that’s healthily low in caff eine. 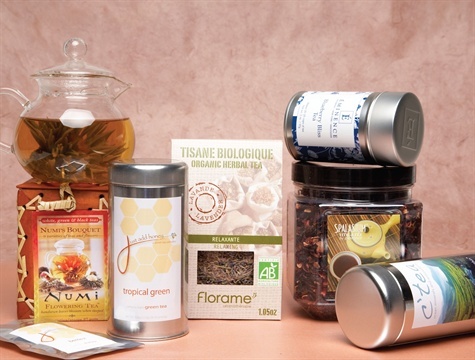 Florame’s Tisane Biologique Organic Herbal Tea comes in Relaxing Lavender flavor, which is perfect for a before-bed treat. From Eminence Organics comes flavor and antioxidant-rich Blueberry Bliss Tea, a chunky mélange of blueberries, elderberries, and black currants. Phyto-rich and packed with vitamins C and E, the organic tea can be used for a hot beverage as well as part of an at-home facial in place of water. Spalasium by Pevonia Holistic Gourmet Vital-I-Tea offers four options of gourmet loose leaf teas that are rich in antioxidants: Slenderize, Rejuvenate, Renew, and Energize. Ingredients such as cranberries, elderberries, black currants, and rooibos red tea work to eliminate toxins. C’watre introduces its new line of teas called C’tea, which is rich in antioxidants, ocean minerals, and vitamins. The tea works to fortify cells and support a healthy foundation to prevent and defend against skin damage.